Disney has announced that the much awaited hand-drawn animation movie Winnie The Pooh will be released on July 15th, 2011. The movie to be released by Disney will be released on the same date as the final Harry Potter movie Warner Bros.' Harry Potter and the Deadly Hallows, Part 2. After the success of critically acclaimed Princess and the Frog, released last year Disney is back with Winnie the Pooh movie which fans have been eagerly waiting for. The movie is a traditional animated 2D movie; the movie will have songs and music done by Robert Lopez and Kristen Anderson-Lopez. 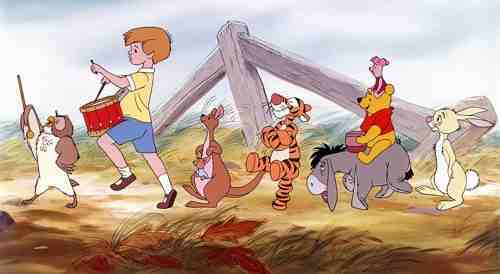 While the story of the movie is based on a combination of 5 stories from the original Winnie the Pooh books written by Alexander Milne. The movie was initially planned as a direct-to-video release but Disney has now decided that they will go ahead and release it in theaters across America. The movie is directed by Don Hall and Steve Anderson, while the lead story artist will be Burny Mattinson, who worked on the original Winnie the Pooh animation. The voice for the animated movie include the likes of Jim Cummings (Winnie the Pooh, Tigger), Craig Ferguson (Owl) and Tom Kenny (Rabbit). What Pooh fans are appreciating is that Disney resisted the temptation to make a CGI movie but they have gone with the traditional approach of hand-drawn 2D.